Viewing topic "Motif XF: Sampling—This Seems Cool !" Is the copy sample to voice function added to the “Main display too? 2. There is a new feature that let’s you take a sampled voice and copy it to a user voice. This let’s you edit the sampled voice and process it with filters, insert effects , EQs , etc just like a normal user voice after the fact. Can users assign pitch, pan, volume, effects to ribbon controllers? or what parameters can be assigned to ribbon controllers? Is this copy sample to voice feature already on XS? 3. There is no non destructive editing, but what you described is duplicating waves on different keys and editing them separately which is possible. Was this duplicating waves on different keys a feature on XS already? When editing the start/end point of a sampled sound can edits be heard when pressing the keyboard or have to heard pressing audition button only? It’s on the main page of the Mixing display. then edit the sampled audio as a Voice. 1 From the Mixing Play display, select a Part to which a Sample Voice is assigned. “VceConv” appears at the tab corresponding to [F6]. the selected Part to a Mixing Voice. Completion of conversion calls up the Mixing Voice Store window. Once stored, F6 will change to Voice Edit and you cna fully edit the Mix Voice with all of the parameters in any Voice. Any parameters in a Control Set can be set to Ribbon control including everthing that was on your list and more. No. You can do the same thing , but it has more steps. Also we are talking about sampling in Song and Pattern Mode only. If you sample in Voice Mode, the waveforms are assign to a Voice right away. After sampling in the Sequencer Mode, you end up with a Sample Voice which you can not edit the Voice parameters. Basically, this is fine if you are recording vocals, etc. But to get more creative, you would need to trun this in to a Voice. Both, the audition button will play the sample at it’s root pitch and the keyboard will play it in the multisample waveform. This is true in both Xs and XF. 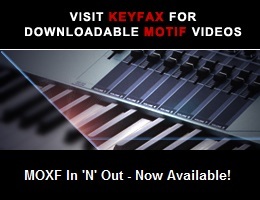 This is cool, when the XF comes out will the manual or Bad Mister do another pdf of sampling?